26" x 20.5" coroplast insert for a "kitchen" area. Outside dimensions: 26" x 20.5" x 4.5" walls. Front wall: 2.5" height with black or white edgers. 3 adult guinea pigs can hang out in our regular Cavy Cafe-sized kitchen. The Bistro is overly large. We really only added the Bistro size of kitchen specifically for the Medium-sized Cage, which is 2 by 3.5 grids long. Because the Medium size uses an overlapped grid, the cage length is non-standard. If you are planning on ordering FLEECE FLIPPERS from our sister store, then this Bistro size takes up that extra half-flipper of length needed. So, instead of needing a set of 3 1/2 Flippers to cover the bottom of the Medium cage, with the Bistro, you only need a set of 2 Flippers. The Bistro takes up 1 1/2. If you order the Cafe Cafe kitchen for a Medium cage, then you'd need a set of 2 1/2 Fleece Flippers. With Fleece Flippers, it's better to stick with interchangeable, standard sizes, hence the Cavy Bistro kitchen was born. HOWEVER, if you get a Bistro in any other cage size (Small, Large, XL or Jumbo) AND you want Fleece Flippers, you'll need to get a Half Flipper in addition to the regular ones to have full coverage. 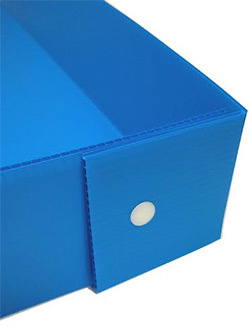 4mm Coroplast 26" x 20.5" x 4.5" walls in your choice of 15 colors! 8 Snap-in Plastic Rivets to fasten the flaps. My piggies definitely aren't potty trained and don't ONLY do their business in this area, but we both like having the separated "mess area" as they do make their biggest messes in here and I love being able to pull it out and clean it relatively easily. It's a little difficult to get out with an offset loft, but I'm not rating it down for that, since it was my decision to offset the loft. Just keep it in mind that if you chose to put it under an offset loft it is not quite as easy to get out. If you are not offsetting the loft, definitely get the doors. I bought this after reading what would be the easiest to clean and decided to go half with bedding half with fleece. I got the bigger one since I have two pigs and might get more in the long run. This works wonders and they seem to do most their business inside of the cafe! It makes cleaning easier so that the whole cage isn't left a mess, and the pigs seem to really enjoy it. I had a cat's litter box as my original kitchen but then got this, so much better!! It is much better and fits side to side so no gaps where my piggie can make a mess. She has a tendency to poop and pee in her house so I also put that in! :) As always, Customer Service and shipping were great and speedy! !